The first warm day of spring brings visions of happy days on the lake with your favorite rod. Then there to your wondering eyes appears your fishing rod with a bow in it. Leaning against the wall for the winter has caused the blank to take on a permanent bow. It is ruined. A good rod can last a lifetime if properly cared for and maintained. A few simple precautions and you avoid the problem previously mentioned. Basic to the maintenance of all rods and reels is to keep them clean. Even the most well meaning anglers can forget about daily care of a rod and reel. It is best you wipe the rod down with a light coat of Reel Magic. It counteracts fish oils and keeps sheen on the rod finish. Carnauba car wax on the shaft will help clean and protect it from further damage and grime. Handles of the rods require special care. For the foam handles use soap and water to clean then without causing the handle to expand. For a rod with a cork handle Comet Cleanser and water in a paste form does the trick. Windex is good for cleaning the reel seats. It will get into the threads and really give them a good cleaning. Moving to the guides of the rod, it has long been known that passing a Q-tip through the guides will cause cotton strands to be caught on any nicks or chips in the rings. Look for loose rings at the same time. Most loose rings go back into place with a little hand pressure. One common problem is a missing ring on the tip of a rod. This is especially true if the rod is normally stored in a rod case. The rings get knocked off without the angler being aware of it. Rods to be stored in a rod case should have the top open a little to allow air in during the storage. When storing rods temperature is not a factor. However, rods should be hung by the tip so that they hang straight up and down. This will help keep the blanks straight. Leaning them against something can cause the rod blank to take a set affecting the ultimate performance. For a two part rod, a problem often found is making the connection snug and secure. A little bees wax on the male part of the connection will keep the connection secure and water tight. When traveling by airplane most anglers store their rods in an aluminum case with a sealed top. They are beginning to find that once at their destination the rods have blown up. That is the rod blank has expanded to the point that it comes apart. The rod is destroyed. Apparently the change in air pressure causes the problem. If the angler drills a 1/8th inch hole in the top of the rod case the problem is resolved. Rod care is not a difficult thing. Simple common sense and the above pointers will result in rods giving much longer serviceable life. Not having to replace a rod each year or so, can result in money available to purchase one of the top line rods. 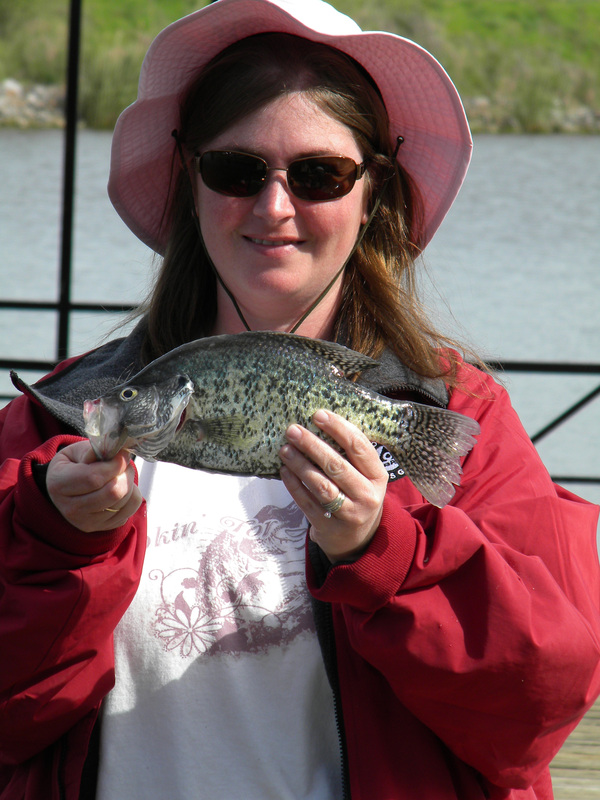 This woman took a nice crappie from one of the docks at the parking lot on Wolf Cree Causeway. Wolf Creek Causeway in the Crab Orchard National Wildlife Refuge near Marion is actually a causeway that joins two areas of the refuge. Fishing along this causeway is generally good all year. It is one of the few lake areas with good structure and still available to the shore angler. The lake itself is 65 years old, old for a reservoir. A lot of the bottom is silted in with the run-off from Wolf and Salt Creeks. People think that it is just too good to be true that a public area, easily accessible, produces such a good quality angling opportunity. Crab Orchard National Wildlife Refuge is a complex of wetland, forest and lakes located southwest of Marion, Illinois. The Visitor’s Center located two miles south of Route 13 on Highway 148 is a good place for the angler to begin a trip to Wolf Creek. Wolf Creek is a 1/3 mile long gravel road that crosses Crab Orchard Lake at about the middle. Parking facilities are available on both sides of the roadway at the North end. You can travel across to the other side but parking is limited on the south side of the lake. Walking south from the parking lot, one comes upon numerous shore fishing sites. Several floating docks and other shore fishing areas are located at the bridge where the two lake areas join. West of the causeway a few feet and you come upon the handicap pier and another long dock. As one walks along the roadway, there are paths down to the shoreline at a number of points. Each of these leads to a good fishing point. Anglers who regularly fish from these points wear down the vegetation. Most of these locations contain submerged brush in 3 to 5 feet of water. The key to finding fish along the causeway is finding the brush. Some locations have it near the shoreline and at other locations it is as much as 20 feet out. It is important to fish tight to the brush. It may cost a lot of tackle but is worth it. About half way across the causeway is the bridge that allows boat traffic to pass. Wooden stairs on both sides of the roadway and both north and south of the bridge allow anglers access to the water. The shore is concrete and angles into the water with casting docks. One can fish from the concrete if it is dry. If it is wet it is best to avoid it, as it is slippery. From the concrete, one can fan cast the entire area. In the colder weather crappies are in the current of the area between the bridge supports. If they are not there, try the area off the points. They will be either up near the shoreline or as far as out as 20 feet. Cast from all four corners of the bridge opening. The floating dock, between the causeway and the shore fishing at the western parking lot, is an ideal place to cast to the shoreline of the western side of the causeway. In the past the only way one could do that was to be in a boat. For the shore angler this could be a boom. Traveling west to the parking lot, there is a bit of brush off the southwest corner of the lot. The short dock from the parking lot is a popular place for catfish anglers. A Special Use permit is required to explore the Crab Orchard National Wildlife Refuge. Permits either yearly, daily or weekly, are available at the Visitor’s Center. The center is open weekdays from 8:30 a.m. to 4:30 p.m. Day permits are available at the door of the Visitors Center 24 hours per day. Just follow the instructions printed on the box to the right of the door. There are also brochures and maps available at the center. Camping is also available on the refuge. For additional information about the refuge contact the Visitor Center, 8588 Route 148, Marion, Il 62959. Although often fished the entire year, Lake of Egypt can be a fish factory in early spring. The weather may be unstable. It can be iced one day and 70 degrees the next. The fish will change daily and even hourly. The water temperatures tend to hover between 50 and 55 degrees. Lake Of Egypt is a 2300 acre reservoir located about 7 miles south of Marion, Illinois, just 3 miles east of Interstate 57. Built by the Southern Illinois Power Cooperative, the 93 miles of shoreline belongs to the U.S. Forest Service and private ownership. The average depth of the lake is l8.5 feet with a maximum depth of 52 feet. Milfoil and other weeds form the shoreline to a depth of 8 to 12 feet. Bass thrive in the weeds with the average bass taken in the 3.5 pound class. Other fish found in these waters include crappie, bluegill and catfish. There are three marinas on the lake. Two, Pyramid Acres and Lake of Egypt Marina, are on the northeastern part of the lake. The third, Egyptian Hills Marina, is on the eastern shore, further south. There is no limit on motor size for boats but you must display a boat permit. They are available at the marinas. There is a 35 mile per hour speed limit and all boats must stay more than l00 feet from the shoreline of any residence. Anglers can fish deep water or go in shallow and fish the vegetation (coontail and patches of milfoil). Some of the larger fish are in the duckweed. There is a current down the middle of the lake. Early in the morning one can see the steam rolling off the water. That is the current carrying warmer water down the lake channel. Fish that channel and one will find fish, according to this resident angler. 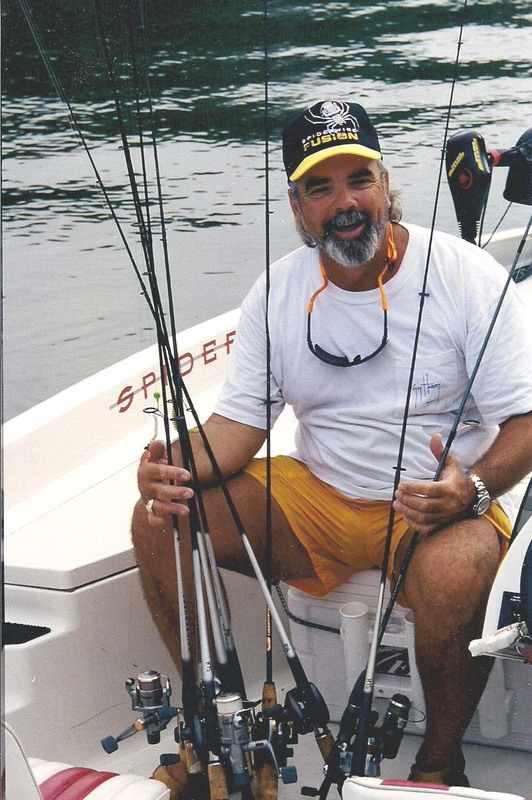 Another tip is to fish in a west wind which will allow you to catch fish. An east wind makes the fishing almost impossible. The grass is the same on both sides of the lake. The southeast wind will still blow bait fish up on the west side. The home development on the east side could be part of the challenge for anglers. It has reduces some of the fishable water. One can not fish within 100 feet of a dock. That reduces a lot of territory. There are a lot of docks along that side of the lake. The shoreline tends to be more open of the west side as there is less development. As a result there are more people fishing that side where they have more fishable territory. Wherever one fishes on this lake, the water clarity is good. The lake cleans itself well in a few days. As a result it is one of the clearest lakes in southern Illinois. Growth of fish relates to the amount of food available and temperature of the water. If the temperature drops, as during winter, they may cease to feed. Biologists tell us that fish production relates to food abundance and production. Other factors that effect fish productions are: dissolved oxygen, temperature, ph and acidity, as well as availability of reproductions sites. Last spring the water levels on Lake of Egypt were ample and the temperature normal. The forage appears to be ample. All of the conditions are present for a good spawn. As mentioned earlier, there is a 35 mph speed limit on the lake as well as other site specific regulation. As with all lakes, it is important to know the regulations before taking to the water. Failure to do so will not only get you a ticket, it also puts pressure on other anglers who want to use the area in the future. Pay particular attention to safety issues. We all know that professional tournament angling has resulted in vast improvements in tackle and boating equipment. But, it also has improved the attention to ethics. Do not leave yours at home. The ice will soon be off our favorite lakes. Most of us as we get older tend to prefer the warm confines of home to fishing out on a lake in 40-degree temperatures. Kyle Schoenherr of All Seasons Crappie Fishing changed all of that by enticing me out on the water this morning with tales of 2-pound crappie. The limber crappie fishing poles provide the sensitivity to feel virtually everything that comes into contact with the terminal tackle. All Seasons Crappie Fishing (www.allseasonscrappiefishing.com) is a guide service dedicated to crappie fishing all year. Kyle is also a tournament crappie fisherman who competes on the Crappie Masters tournament trail. Cruising along on Lake Kinkaid near Murphysboro, Illinois the wind is down but the air cold. We move to some bluffs to start fishing. Kyle explains that the bluffs continue into the water and below the surface are rocks and brush. What is surprising is that the structure is some 40 feet below the surface. Our terminal tackle is the standard crappie rig of a heavy sinker at the end with a tag line tied about 18 inches up. On the tag line is a small jig or a hook with a minnow. The rig is jigged vertically. A slight twitching motion applied gives the minnow or jig a realistic presentation. Usually in deep water a shorter rod is used. However, Kyle likes the sensitivity of a long pole. We slowly troll parallel to the underwater ledges beneath the bluffs. Kyle explains that he prefers to follow the lay of the land beneath the surface as opposed to the shoreline. The bottom here drops off three or four feet which seems to make a difference in the fish we see in the locator. Kyle catches several fish. We relocate across the bay. Reeling in my line it suddenly goes sideways. I do not feel a hit until I set the hook. The flexible rod allows for some fun fishing action as the crappie comes to the surface. It is over 2 pounds in size. Kyle quickly nets the fish and places it in a Slabmaster Crappie Saver. This fish comes from 33 feet beneath the surface and if we are to save it alive, we must pay immediate attention to its air bladder. The Slabmaster holds the fish to measure for length and an estimation of age and weight. In order to keep it alive we must deflate the air bladder. Kyle inserts a hollow needle into the air bladder at a 45 degree angler. Where is the air bladder? The Slabmaster has a slot that marks the location for the fisherman. Kyle inserts the needle and the process is over in seconds. The fish is alive and will stay that way in the live well. In tournaments that is important as all fish weighed in dead result in a points penalty which could make the difference between a winner and an also ran. Catching this fish is a highlight of the trip. Kyle assures that 2-pound fish are not uncommon in the lake but it is a personal best for me. 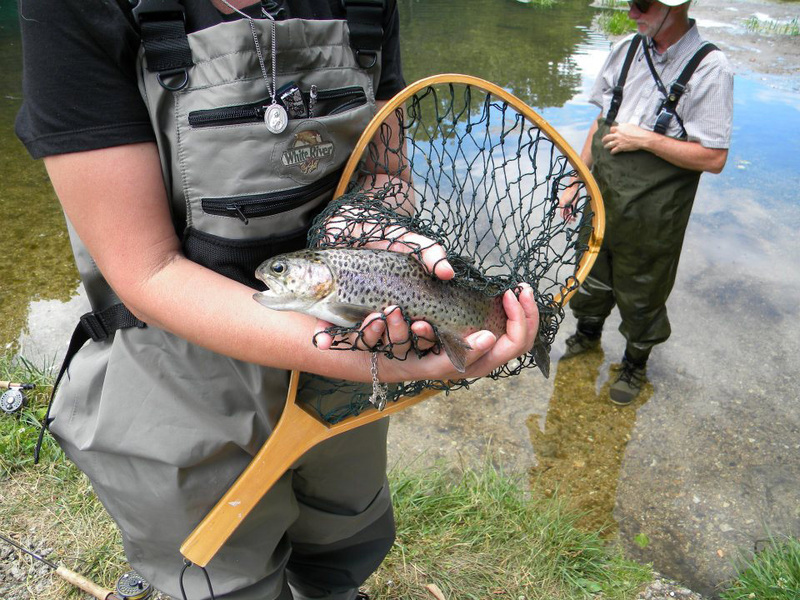 Put-and-take trout fishing requires more thought than most anglers believe. Sure it is possible to catch them with little effort. Consistently getting results after the first few days is a little more difficult. Finding fish requires knowledge of their habits. Rainbow trout are the prominent stocking fish. That is because they are the easiest trout to grow. They take to the food, the overcrowding and the polluted water a little bit better than other trout. Trout fishermen in the classic sense typically throw very small flys to these sight feeders. The reason they can do that is that the fish’s vision is very acute. Conditions cause the fisherman to use certain flys. Just because anglers prefer to use dry flys because it is more fun it is not the only way. The trout’s eyes are mid-range. They are comfortable looking up for food as well as down making them multi-directional feeders. In the first few days away from the hatchery, trout seek their food on or near the surface like the food pellets they eat in the hatchery. Gradually they revert to normal food sources in the water such as small minnows, crustaceans and insects. Trout in the wild like cold moving water with a rocky bottom. They can survive in pond water but on a more limited basis. They prefer water in the 40 to 55-degree range. On rivers where water levels change during the day, they survive through adaptation. When the current is fast, they will be near the edges of the river system. As water levels lower and current decreases they go more toward the middle. Trout have a lateral line like all fish and respond to movement, vibration and sound. The lateral line will allow them to pinpoint the direction from which those things emanate. They move toward the sound and then use their sight to zero in on it. When removed the hatchery and placed in any body of water there are two things to remember about trout. Where did that truck back up to? And what do you have a lot of in your tackle box? For about 3 days they are stupid. They spend some time where they are released trying to get acclimated. They will bite anything until accustomed to the habitat. They do not have the instincts and intuition of a wild trout because they have never had to do anything for their meals. In most instances most manmade lakes have an area where maybe there is a little bit of a spring. When builders dug down perhaps they found a little spring trickle. If the fish find that area they hang out there and feed to survive. Stocked lakes do not usually have a trout kill. Anglers and local predators remove most of the trout. In warmer climates, the remaining fish tend to die in hot weather. Every once in a while someone catches a whopper in a lake where they have been stocking them for a number of years. White bass provide a variety of angling opportunities on Rend Lake as they move from staging areas to the spawning areas of the lake. White bass are a cousin of the saltwater striped bass and as such have much of the savage instinct of their brethren. They will hit light tackle and give the angler all he can handle. Anglers on Rend Lake sometimes confuse white bass with the hybrid stripers stocked into the lake. What is an immature hybrid can be confused for a mature white bass. It is important to the hybrid population that these immature hybrids return to the water, while the white can go home for dinner. 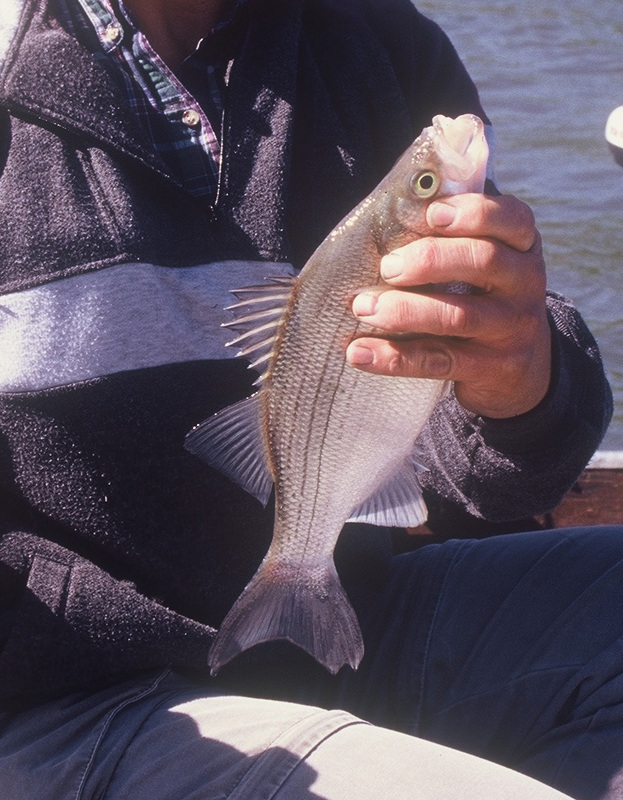 A 14‑inch white bass is a good size white bass, but it is small for a hybrid striper. 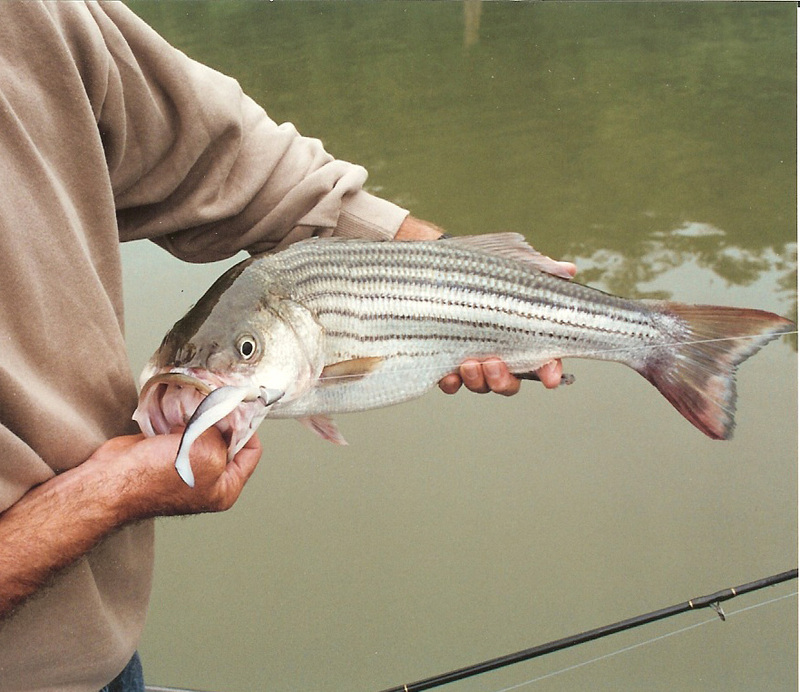 A 14‑ to 18‑inch hybrid stripers weighs 2 or 3 pounds. If returned to the lake, they can grow in three or four years into 10‑pound fighters. Hybrid stripers have two tooth patches at the back of their tongues. White bass have only one. The hybrids have distinct horizontal dark lines on the upper part of the body and the first stripe below the lateral line which is distinct and complete to the tail. Stripes on the upper part of a white bass’ body are faint and the first stripe below the lateral line is indistinct and incomplete. Following the warm rains of April, the white bass go on a feeding frenzy that will last into June. These water tigers become more active as the water temperature rises above 50 degrees. Once the temperature rises above 58 degrees, the fish move out of the staging areas and into the spawning areas. The average size white bass taken by anglers tends to run in two classes. One group is 8-10 inches in length. The second is 12-14 inches. Exceptions do occur. The whites caught in IDNR surveys run from 0.7 to 1.5 pounds. Catching white bass is easy, finding them is the tough part. In the spring, the pre‑spawn fish position themselves on sand bars and gravel banks in fast water. During the spawn, they make runs into the major feeder streams looking for suitable gravel beds. After the spawn, they head down stream into creek channels or roam out into the main body of water. White bass are an active fish that feeds constantly. Whites prefer to spend their time in water deeper than 10 feet but will often move into the shallows to feed. Their favorite meal is shad. If the angler can find large schools of shad, chances are that the white bass are near. When feeding on the surface, concentrations of seagulls will pinpoint the location for the angler. If seagulls are not present, he can find them by spotting the splashing water caused by the feeding fish breaking the surface as they chase the shad. At times the fish will stay up for ten to fifteen minutes. More often they will feed for only a minute or two and then dive back down. Usually they will surface again a hundreds yards or so away. White bass working points and flats are easier to find and fish. One can troll to zero in on white when the surface action does not tip off their location. One can begin trolling at the 5 or 6 foot level before testing the shallower or deeper areas. One can run with moving baits like the Teeny‑R or Bomber crankbait. Lighter line will get the bait down deeper while heavier line can make it run as much as a foot more shallow. Anglers need to position their boat in the general area of the feeding and wait for the white bass to come to them. In the more shallow areas, blade baits are good to use. If the fish are on feeding binges, spoons heavier than one ounce work well because they get down to the fish quickly. If the fish will not actively feed, then smaller, flashier spoons are better. The 1/8 ounce Rat‑L‑Trap works well. If the fishing is really slow, then something like a leadhead jig with a tube-bait is the ticket. The shad imitations are best. Light tackle is a must for these fish. Small crankbaits, spinners and jigs are good with line in the four‑ to eight‑pound test range. The lighter the line the more likely jigs wind up on submerged wood and vegetation. Tip small tube jigs with a minnow or a plastic grub. Plastics with contrasting dark and light colors work well. White is best if picking a solid color plastic. The astute angler will notice the size of the bait fish and match his lure to that size. Angling success tends to be dependent on year hatches. A year with incredible numbers can help carry the population over lean years. The best fishing, in a particular body of water, is likely to be about two years after a large year hatch. White bass fishing on Rend Lake is a ball. For more information about bass fishing and guide service available contact Todd Gessner Outdoors at 618-513-0520. Accommodations on the lake are available at the Rend Lake Resort in the Wayne Fitzgerrell State Recreation Area. The phone number at the resort is 800‑633‑3341. Camping is available in the park. For information contact the site superintendent’s office at 618‑629‑2320. For additional information about the lake in general, contact the Illinois Department of Natural Resources for its Rend Lake Fishing Guide. The guide is free from IDNR, Office of Public Information, One Natural Resources Way, Springfield, Illinois 62702-1271. Reel screeching runs from a big brawny fish break tackle. Hybrid Stripers of the Ohio River are a hard challenge. 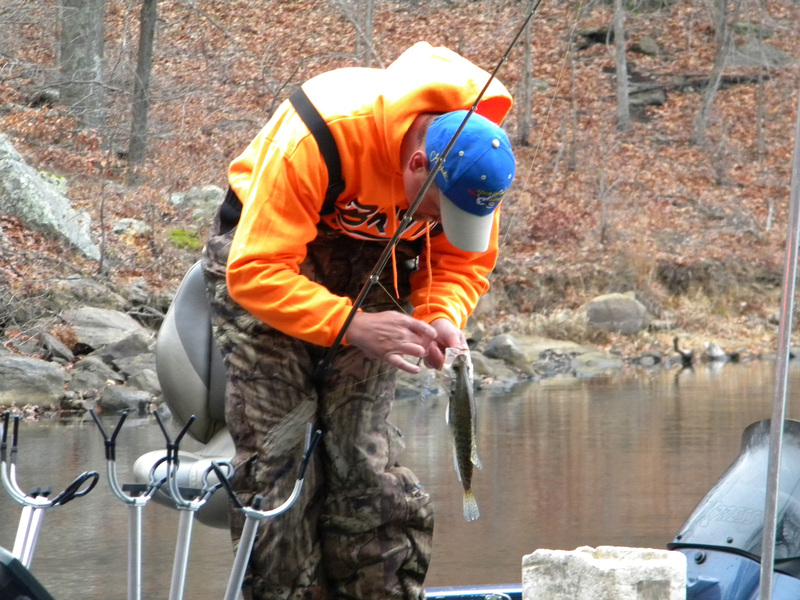 Anglers in southern Illinois find these transplants pay big dividends in fishing action. The striper is a saltwater relative of the white bass. It resembles the white but is more elongated and less compressed with a nearly straight back. The color of the striper is a dark greenish to bluish on top with sometimes a brassy tinge that becomes lighter on the sides. The underside is silvery. Most prominent are the seven to eight narrow stripes along the sides going lengthwise from which they gain their name. Generally they reach a weight of about 5 pounds by their third year. Fish in the 20 plus range are often caught. In the 1960’s striper fry were introduced into Lake Barkley and began to flourish. It was part of a number of such stockings across Kentucky and parts of Tennessee. Some larger fish were stocked into Kentucky Lake. Over time they moved out of the lake and down river into the Ohio River. Additional stocking by the Kentucky fisheries people added to the population. Over the years stripers made their way through the Kentucky dams at the north end of the lakes and established strong populations in the downstream waters especially those below Smithland Dam. Although stripers spend most of the year roaming deep open water in pursuit of shad, they seem to be more confined in the spring. Stable water conditions coupled with spawning shad cause the stripers to move to the more shallow water and dam tailwaters. Anglers move in and cast both lures and live bait into the fast moving waters. Heavy bass gear will handle these fish. A medium or heavy rod and bait cast reel with 15 plus pound monofilament line will work well. A 7-foot rod with a flexible tip is a good choice. The flexible tip allows fish to grab the bait without meeting with a lot of resistance before being safely hooked. Live bait, either shad or skipjack are productive bait. The rockfish’s voracious eating habits allow it to gobble up the bait before the angler is even aware of the strike. Bait is usually placed on a 2/0 to 4/0 hook. Kahle style hooks seem to be the most popular. Some rockfish are taken by trolling topwater lures such as the Cordell Redfins in the early morning hours. Later in the day one can move up close to the dams and locks and cast large jigging spoons and Shad imitations. Large jigs (l ounce) with plastic bodies in pearl or white colors seem to work well. 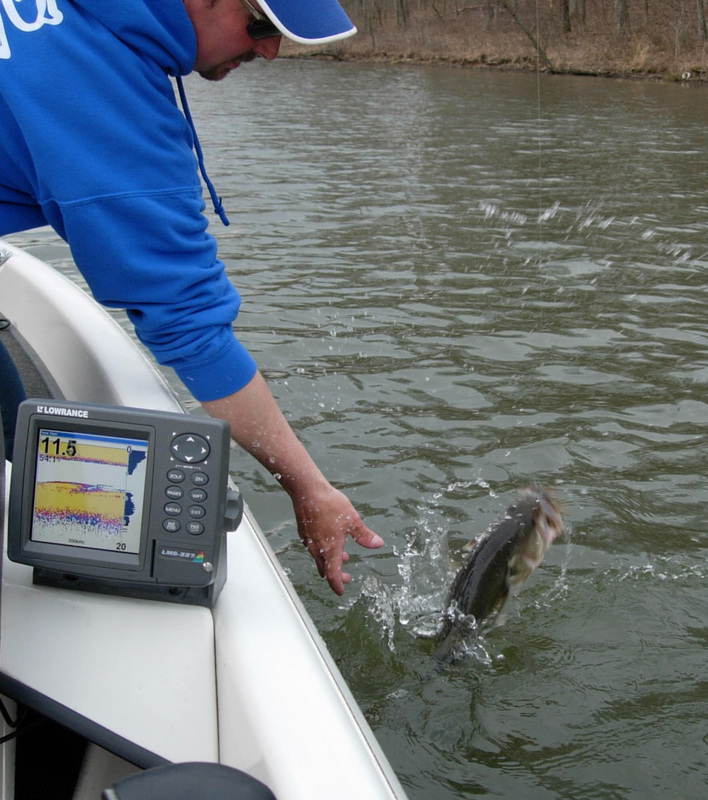 Electronics are used to locate the large school of fish as they chase the shad. Once a school is located it can be fished by jigging, trolling lures or with live bait on downriggers. The jigging is more exciting and productive. Another good downstream location is the sheltered side of islands. Small islands deflect current. As the bait fish move into eddies to rest, the stripers will be waiting for them. Some stripers are found on the upstream end of islands but not as many as will be found downstream. Generally stripers can be found anywhere that there is a current break and a good food supply.